Police had been monitoring the group from Kosovo for months amid concerns they were planning to join Islamist militants in Syria, reports said. But police moved in at dawn on Thursday amid fears of a potential attack in the wake of the last week's murder of four people in London, reports said. Twelve addresses were raided including 10 in the city's historic centre. One of the raids took place close to the famed La Fenice opera house at around 04:00 (02:00 GMT), Italian media said. Police said all four of those held had Italian residence permits. They said Italy's specialist Digos crime squad had been investigating the three adults on suspicion of radicalisation. Police decided to move in amid concerns that the alleged cell was planning a similar attack in Venice, possibly targeting a high profile tourist site such as the Rialto bridge over the city's Grand Canal, Italian media reported. 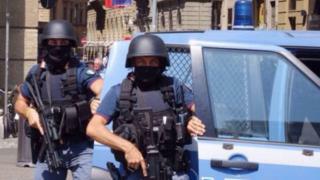 Defence Minister Roberta Pinotti praised the authorities' handling of the operation and said it showed their commitment in the fight against terrorism.